As a brief background to Hypotopia, the idea and name came about as a result of a protest project created by a team of Austrian students in response to the Hypo bank scandal. Hypo-Alpe-Adria-Bank, after various criminal acts such as balance sheet falsification, reached a point of crisis as a consequence of big losses, which led to a massive government bail out costing the Austrian tax payer a staggering €19 billion. The Austrian people however stayed largely muted on the subject, unable to comprehend the scale of such a sum. That was until architecture student Diana Contiu and her boyfriend Lukas Zeilbauer decided to take action. Together, they formed a team of fellow students, each proficient in their own specialist area, to create a project that would show the Austrian population what €19 billion actually looked like – and what could be done with that amount of money. Their idea was to build an entire city for €19 billion – but not just any city – this city ran on sustainable energy, provided jobs and education for all, with green areas for everyone to enjoy regardless of status, and, of course, had no banks whatsoever. It would be a utopia. The team spent weeks (approximately 10,000 hours) calculating precisely what could be built for the cash. In order to communicate their vision to the general public, the students built a 100x scale model of Hypotopia in wooden and concrete blocks donated by local businesses. The model city was built along a winding river and housed over 100,000 inhabitants, making it the sixth largest city in Austria (if it were real). The fantastic structure was unveiled and exhibited on Vienna’s Karlsplatz from 15th to 30th October 2014. Since then, the model city has received media attention worldwide and thousands of visitors. Most importantly, it has given the Austrian people a platform on which to protest. Sadly, the physical model of the city has now been dismantled but the idea lives on, which is where we are delighted and honoured to have played a small part. 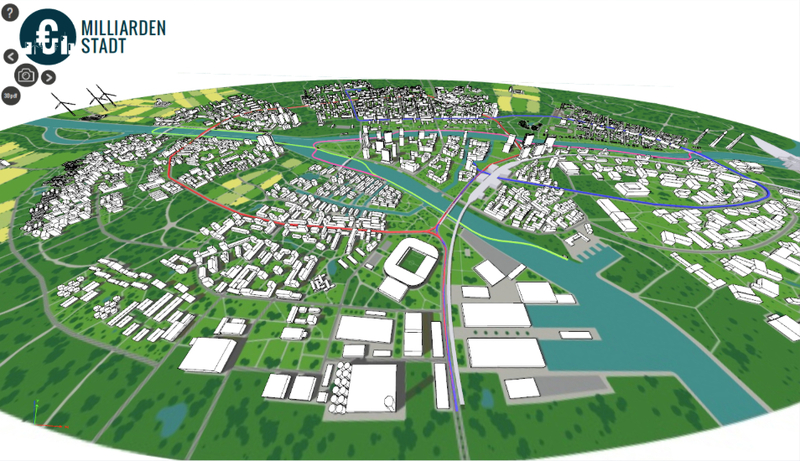 The 3D virtualisation of the city can now be viewed in a 3D PDF. You can view the interactive model here. The 3D PDF was created by DEEPINTERFACE (www.deepinterface.com), a young Austrian start-up company born in the art and architecture world who aims to leverage the value of 3D CAD data, for Real Estate, the building industry and Facility Management. The 3D-PDF was discovered as a suitable file format for a fast and effective communication especially for Non-CAD users especially with smart templates, high quality textures and PRC highly compressed internal encoding. Responding to the national disaster and the debt burden on all Austrians, DEEPINTERFACE keenly followed the student’s project – officially ignored by politicians and the university but well perceived by the public. Based on an original WebGL-model of the individual town districts created in AutoCAD by student groups and finally merged in 3DsMax, the DEEPINTERFACE team used a special template scripting method linking into a database containing information about costs, usage and topology. The database information was embedded into the PDF enabling users to display them by simply clicking on a node in the 3D PDF. The process used PDF3D’s XML Server system for advanced 3D PDF generation features. The graphic design concept used the student project website (www.milliardenstadt.at). We hope you are as inspired and moved as we were by these students’ admirable efforts in visualising the incredible scale of this financial bailout. It has certainly impressed all of us at PDF3D.